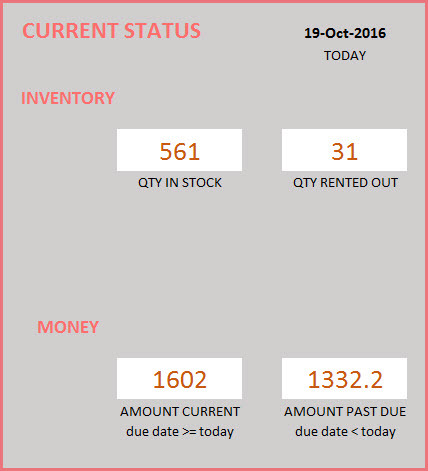 This Excel template can be used to manage inventory and orders in a rental business. If you are renting assets to your customers for a duration and charging for the rental, this template can help. You can manage all your assets, customers and orders in this template. Determining availability of assets at any given point of time is instant. You can also create invoices that can be printed or exported as PDF. In addition, you can quickly view and analyze sales performance in the built-in Sales report. The Rental Business Manager can be used regardless of the items being rented in your business. Some of the examples are equipment rental, furniture rental to parties or events, renting wedding items to weddings, construction equipment rental, audio video equipment rental, bike rental, sports equipment rental and book rental. Microsoft Excel 2010, 2013, 2016 for Windows; Microsoft Excel 2011 or above for Mac. Create invoices instantly. Print or export as PDF and e-mail. The following are the key features of the Rental Business Manager. Enter order number, Order Date, Customer Name, Rate Type, Rent Out and Return Dates. Then, enter specific Assets/products to be rented. Customize quantity & unit price. Based on user feedback, the template now can support renting multiple units of an asset. For example, 10 Chairs or 5 tables. In the rental business, one of the most critical needs is to know how many units of an asset will be available for a specific duration that the customer is needing. We can check availability in two ways. Before entering the order details, we can use the simple availability checker to view available units of an asset for a specific date range (90 day max). We can also use the Availability calendar to see the number of available assets. This view reflects the overall availability considering all the orders that we have entered in the template. After we enter all the order details, the invoice sheet can populate the invoice automatically for us. We can come to this sheet anytime and just enter an order number to instantly create the invoice. We can easily print the invoice or export to PDF. The invoice can handle up to 65 line items. The first page displays 20 line items and the second page 40 line items. The template has several accounting features built-in. We can track payments made by customers. The template then calculates the due amounts. We can filter to all unpaid invoices easily. We can handle tax rates at Order level and also choose which products are taxable at product level. Similary, discounts can be product level discounts as well as Order level discounts. The calculations are automatically done by the template. We can also track operational expenses in our business. This will be summarized in the Report. We can manage all the customer data, order data and product data in one workbook. Data management is simple and easy. The template provides an interactive 5 page report sheet that is automated. We can view the current inventory levels in stock and quantity rented out. We can view summary metrics for any date range. Monthly metrics are shown as table and a chart. One of the critical insights needed is to know which products are performing well and which are not. We can view top or bottom performing asset categories and assets. We may want to drill down into specific product/asset and see the performance in more detail. Understanding which customers are contributing the most to the business is helpful in nurturing those business relationships as well as focusing on how to improve business from other customers. Very excellent and well done, do not regret my purchase and I recommend for any Rental Companies. I using this templates from last few months, it amazingly reduced my mental pressure. Managing rental business via this template is very easy. Great tool, love the simplicity and reporting. Well thought out.